Angus Brims and John Forbes -winners of the prime lamb dressing contest. 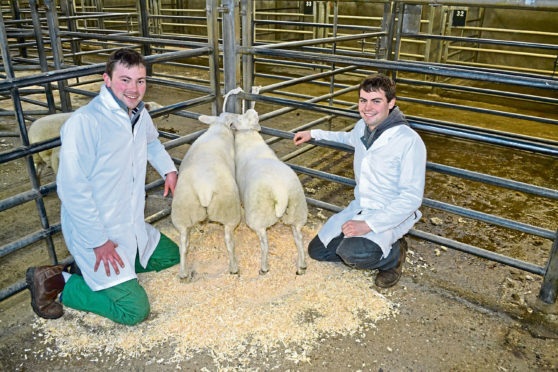 Young farmers from across the north flocked to the Caithness Livestock Centre at Quoybrae for a series of competitions. Contests were held for beef cattle dressing, prime lamb dressing, agri-skills and speech-making. In the beef cattle dressing competition, judged by James Manson and Louise Mackay of Upper Northfield, Wick, 10 teams competed with cattle supplied by Alan Polson of Westerloch, Keiss. First place went to James MacIver and Graeme Rhind from Lower Speyside YFC, while the junior prize went to Alistair McCarthy and Beth Douglas from Bower YFC. Eight teams competed in the prime lamb dressing competition, judged by Jonnie Campbell of Bardnclavan Farm, Westfield, and James Barnetson from Lynegar, Watten. First place went to Angus Brims and John Forbes of Bower YFC, with the junior prize presented to Orkney’s Keith Isbister and Campbell Ridland. Seven teams competed in the agri-skills competition which included tasks such as grading and weighing lambs, digger driving, and crop disease identification. First place went to a team from Udny JAC comprising Tom Bruce, Campbell Harvie and Peter Smith. Meanwhile, in the speechmaking contest, held at the East of Caithness Campus in Wick, six teams were judged by Kellie Coghill, Willie Budge and Graham Mackay. The winning team was a trio from East Mainland, Orkney, comprising Shannon Foubister, Charlotte Hume and Orla Tait. Second place went to a team from Udny JAC comprising Rhea Work, Angus Riddoch and Gail Taylor, while third place went to Sandwick’s team of Amy Neil, Mhairi Linklater and Cody Chalmers. The teams will go forward to represent the north region in a national speechmaking competition in December. Lastly, a quiz was held for junior members and the top prize went to east Aberdeenshire’s Gail Taylor, Rachel Milne and Rhea Work.